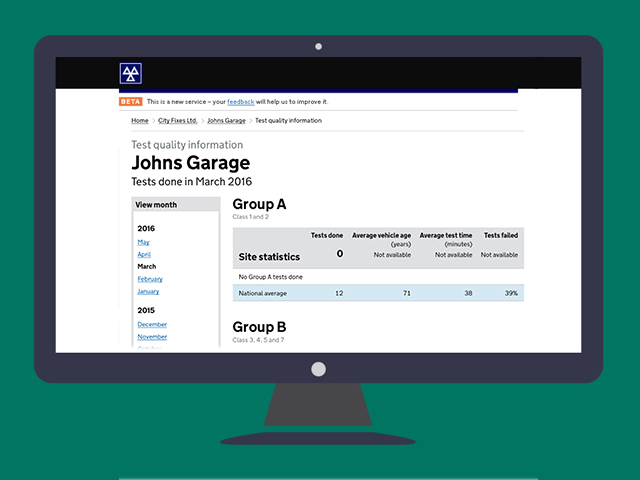 Everyone who uses the MOT testing service can now access test quality information (TQI). 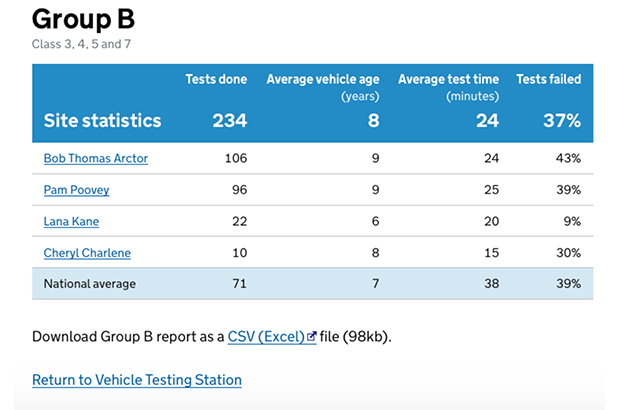 You’ll find useful statistics about how many tests your garage has done, how long your tests take and what your testers tend to fail vehicles on. You’ll be able to compare all this information against the national average. Authorised Examiners (AEs) and site managers will be able to use this to monitor and improve the standard of testing at their sites. You’ll be able to compare all your results against the national average. There'll also be a breakdown of tester’s failures by component category and the national failure rate for those components. You’ll only find the information for the classes of vehicle that your VTS tests. So if your VTS only test classes 1 and 2 vehicles then you’ll only see information for those classes. If you test all classes of vehicles then you’ll see information for all classes. The information displayed only includes the results of initial MOT tests and doesn't include any re-tests or cancelled tests. MOT tests that have been recorded as a pass with rectification (PRS) will be classed as failing the initial test. You’ll be able to download a copy of all this data. TQI will help you manage the quality of testing at your facility. How you use it will depend on how you manage the site, its size and number of staff, etc. You should review this information regularly and look into any unusual differences in the data; documenting the outcome of any investigation you’ve undertaken and what action you took. An example could be if a tester’s fail rate for a component category is 20% and the national failure rate is 8%. In this case, you could organise quality control checks on failed tests where the tester has failed components within that category. You could check the tester’s understanding of the pass/fail criteria then record your findings. It’s important to show that you’re reviewing, understanding and acting on the information found on the system. DVSA’s vehicle examiners will look at this information before they visit a VTS. During a site assessment, they'll look for evidence of any action taken by AEs where they find unusual differences in the data. As there could be valid reasons why a testers fail rate is unusually high or low vehicle examiners will look at all the facts before taking any action. We've received some feedback asking why the component fail rate is higher when shown in TQI than when it was shown in the MOT comp as a Scheme Performance Report (SPR). This is because TQI uses the number of failed initial tests as part of the calculation, whereas SPR used the total number of initial tests (passes and fails) to calculate the rate. We've also received feedback that some of you can’t effectively use TQI to compare testers fail rates as your testers carry out differing numbers of tests per month. We're planning to review how this information is presented as we want to make sure it benefits users and contributes to improving the quality of the MOT test. Please keep sending us your comments and suggestions about the MOT testing service, as it's only with your feedback that we can introduce things to the service that you want to see. Let us know in the comments below or send your feedback about the MOT testing service to MOT@vosa.gsi.gov.uk. This article was updated on 29/11/2016 to include your feedback on TQI. Test results are area specific, town cars get a high percentage of failures on brakes due to lack of use and where I am its mainly suspension and lights due to the poor state of the roads. I have tested in the south and north so I know from experience. I think everyone needs to carry on their normal practise, on the other hand I can see VOSA needs to have stats. As long as human beings do this job almost every car tested will get a different result from each tester that looks at it. I only test vehicles which have just been serviced , we always service vehicles first and replace any worn parts which might fail the M O T .
What is my national average going to tell the D V S A ? I was once asked why by vehicle examiner why I was failing a lot if coil springs and bulbs!! !i actually looked at him in disbelief and asked if I he really wanted an answer or was it a joke question!if my statistics show I am failing high amount of bulbs or whatever I don't want my judgment questioned over statistics!in all honesty I feel the mot scheme is becoming a bit of a farce! I work for the Royal Mail and all our vehicles have a full service before the mot test,where all mot items are checked,so my failure rate is very low compared to the national average. Not bad. But according to the % my NT has a 100% failure rate on Number plates and Vin numbers. When a tester records a test where the outcome is PRS a VT30 refusal notice and a VT20 pass are produced. The VT30 refusal is treated as the initial test and is used in the test quality information calculations. The VT20 pass is treated as a retest and not included in the test quality information calculations. If you email mot@vosa.gsi.gov.uk with the VTS number, testers username and when this happened we can look into this for you. Yes, something is not right, I looked at mine and it shows that I have failed a few for road wheels. I've never failed road wheels, only advised a couple, so the new system must be picking up advisory's and showing them against our fail rates!!! The development team is aware of this issue and are currently working to fix this. I have a 60%fail rate my colleague have a 100% pass rate why he services his first and I do all the ones that comes through the door so how would that work ? I thought we did the tests to make sure that the vehicle are in a road worthy condition not to get your averages the same as everyone else. It does not mater to me if all the vehicle I do in one day pass or fail, I'm not going to compromise my test standards to get my averages right. So going back to like the old system was when you printed out your testers logs ,does this mean that the old system was better than the new one ?? ( think we all know the answer to that ) it's just cheaper for them and more expensive for the testing station these days !! how will this work in a station like mine who only test we are not looking to fail as other testing staions do just to get the easy jobs like tyres etc we have a high through put and most of our cars come ready for test as most customers have the car serviced before the test . Averages are important as they show you who is doing what , it is always perceived to be big brother etc watching however this is another tool . There is no pressure to be an average it is just useful information every test station has a different set of customers and vehicles , what matters is the job is done correctly . If you are a multi tester station it is interesting over the course of time to compare testers , on a single tester station it is also interesting to compare to national average where no comparison within the testing station is possible . It will not affect my testing standards as I endeavour to follow guidance from the manual as well as discussing with other testers on site if necessary , it will still be my test and my decision . TBH i never have nor ever will give a flying monkey's under carriage about statistics & never check percentages;& why should i ? All i want to do is carry out a full,fair & as far as possible to the book MOT test! Every car i test is carried out on that vehicle's merits,stuff statistics! What would DVSA rather me do? Fiddle figures to suit them over actual road safety?Rubbish! Sound like statistics should matter more than actual safety. Consideration has to be given the type of car like small new-ish 2 door, eg. C1s' , MX5s', can be examined and logged in 30 minutes. On the other hand, 5 doors, tail gates, 7 seaters all extend the time. It took the two of us 2 hours to test and log the failures on a Rolls Royce. But one Rolls Royce every blue moon number crunched into an mean average doesnt mean anything apart from bad for the books. What good is an average percentage ? If a car fails its test it fails because it's not road worthy and should not affect your decision just because you averages are low, the mot is not a number crunching exercise its there for the safety of the road users and not government targets !!!! I got ask why i failed "position lights" alot , my answer was if they didnt work i failed them? We allow an hour for a test? If it takes less great, if it take a more time, that normally means there is alot of failure/advise items to do. I just test what comes through the gate and to the standard set . As for states they mean nothing as a lot of the time many testers will not bother with things like washer bottle empty they just fill it. One size doesnt fit all as the saying goes as in some of the above comments some testers never come across corrosion as they work at main agents doing fairly new cars some of us come across it more often so the averages should be taken with a pinch of salt, A.Es and Q,Cs,should only be concernd with carrying out tests to the correct standards,Garages that have sales targets & bonuses related to MOT testing should be looked at more closely. Funny a lot people say national average, well surely that would depend on where you live/test. Roads vary from area to area or council to council, some of us might fail 25% on suspension and head light aims because of poorly maintained roads. If you live near the coast corrosion could play a major part too. We shouldn't judge ourselves on an average pass/fail. Just do what we're doing now. About time this was reintroduced,it was a good way of monitoring my testers results and dealing with anything that was unusually high or low compared to the National average. I always printed off the results and went through them with my testers. I think the new system is eventually becoming as good if not better than the old system..
Why are testers not able to view this. Seems like more "big brother" to me. Would be nice if testers can see how they compare to others when disputes over productivity occur, work load sharing & more importantly, wages. We don't put safety boots on at our cost, buy tools inc pens just so we can get a small percentage of what we earn our employer only to be told "your going too slow" without back up to prove facts. Under the old system testers could print out performance reports & show employers ourselves. They couldn't disagree with our comments then as it was in black and white for ALL to see. Now it's just a case of testers taking the word or the employer and lumping it! All MOT testing service users will be able view this data not just Authorised Examiners and site managers. You'll also be able to download the data as a spreadsheet and print it off if you wish to do that. Oh, OK. Many thanks. Didn't read it fully obviously. Ooops! liked this option on the old system also good to see where improvements can be made and where things need looking at . Just like the old system. That's good new's then, now I as a site manager/QC can see how long my NT's are taking. Spot on Phillip. I would also like to enforce the comments regarding failure rates. It depends on what comes through the door to which we have no control. Whilst some stats may give an indication that an NT may beveither struggling or has a high failure rate they can be misleading . Bang on Philip; Quality of test far out weighs speed of test & anyone who thinks vice- versa should be shut down!